Another trusted skin care products I know is from Cleopatra's Secret Skincare. It is inspired by Cleopatra (The Last Pharoah of Egypt) natural and effective beauty rituals and practices. Cleopatra's fame because of her exceptional beauty and for loving herself is still alive until our generation. 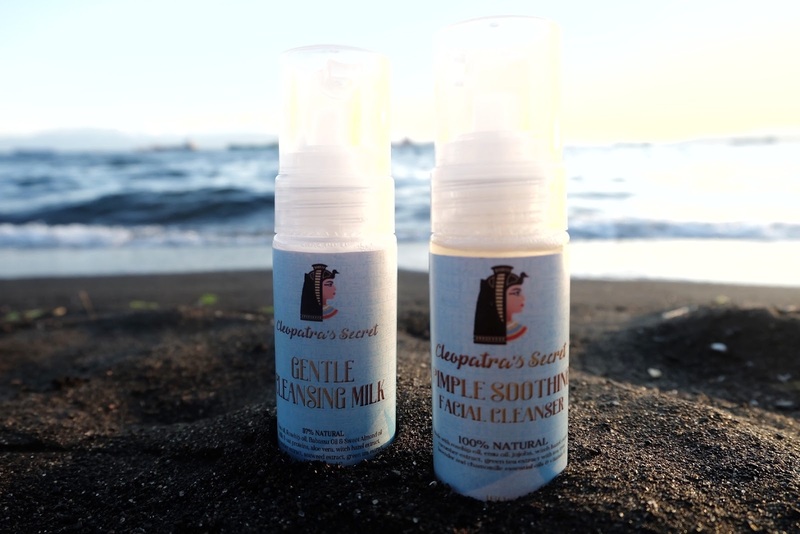 "All our skincare products are proudly manufactured in the Philippines using luxurious organic ingredients, combined with the latest premium quality cosmetic active ingredients issued from plant cell cultures." It is actually my first time to have a product that has an ingredients coming from a plant cell culture, at least that is what I know. Nonetheless, that means their products is at high quality. Their organic ingredients is also FDA-approved so you don't need to worry. 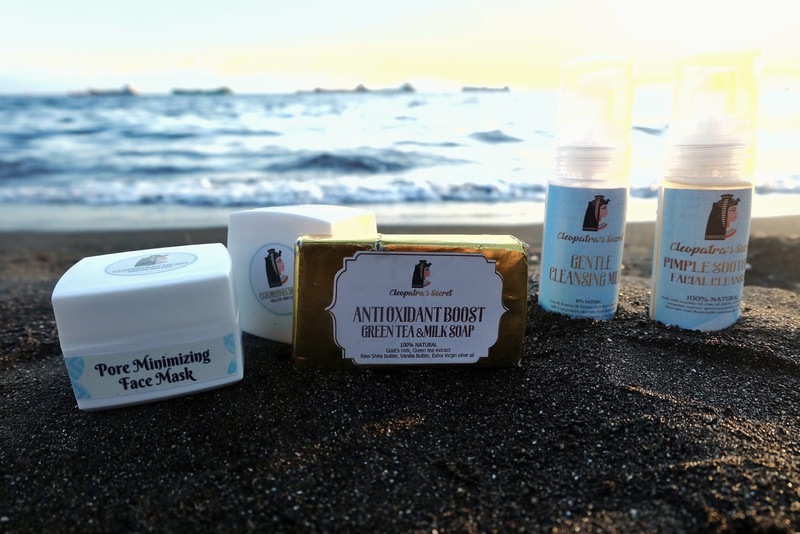 I got the the Antioxidant Boost Green Tea & Milk Soap, Pore Minimizing Face Mask, Pimple Soothing Face Mask, Pimple Soothing Facial Cleanser and Gentle Cleansing Milk. I planned to make a review for the pimple soothing mask and facial cleanser because I want to tests it effectivity on my pimple break out due to my hormonal imbalance and the rest for the giveaway, so stay tuned! Grean tea leaf surely have an antioxidant property because it is rich in polyphenols that is good for rejuvenating the skin. It can also improve one's skin complexion and makes it healthier by flushing out toxins and reducing inflammation. The green tea itself can act as a toner that can help in drawing out impurities. It also contains catechin which is an antibacterial agent fighting acne-causing bacteria. It surely have amazing benefits for everyone. 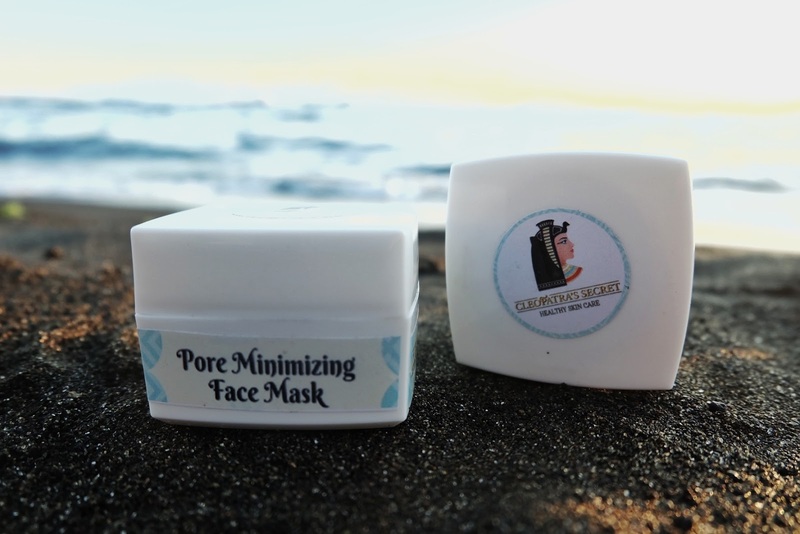 Lots of feedback came out that the pore minimizing mask has been very effective for them. They say it has a minty effect on your skin and it is also advisable to use it only once a week. The fact that it absorbs oil links to the benefits that it can reduce the size of the pores. But for my readers and blog followers I wanted to give this to them so I don't use it. I was even tempted to try it cause one of my face problems is that I do have open pores plus my very oily skin leading to pimple break outs. For this one I used it. Pimple break outs are getting worse than ever. I enjoyed applying the mask every night and realized that the redness of my pimples lessen. It has a poking or even itchy sensation when its time to wash them out. Smoothen face came after that. But because my pimples were from hormonal imbalance I need to stop using it and take antibiotic medication to stop the break through. However, the mask is still effective for me for lessing swelling and inflammation. Its my first time to see a cleansing milk, yes its true! It is indeed cleopatra's secret, because as different articles say, Cleopatra preserve her beauty by washing with milk and honey. Milk contains acid that can helps in gently cleansing then soften the skin called aplha-hydroxy. Can be used to achieve a healthy skin even after a whole day using make-up for work and other stuffs. Every night I wash my face with the cleanser before I put the facial mask that come up as a pair with this. They were a perfect combination actually. I love its fruity smell and its foaming effect. (I love using products with foams it easier for me to wash my face.) No salicylic acid for the acne treatment but the tea tree oil does the job for it. Will still use this one after my antibiotic and medical treatment for hormonal imbalance. Done with my review for Cleopatra's Secret Skin Care. I hope you can check their instagram account at @celopatrassecretph. Hi. Are you still using these products up to now?